Like most people, my brain has its unique little quirks. One rather annoying one is this inability to drop certain associations or subjective opinions (particularly ones created by media or some perceived authority at the time), or else some random commonality that connected them in my mind but doesn’t really hold any value. For example, in the 80s, I saw Lea Thompson in Red Dawn, and Jennifer Jason Leigh in Fast Times at Ridgemont High. In my mind they looked somewhat similar, and then there’s the similar sound of Leigh and Lea. Since then they are forever connected in my head, I can’t see or think of one without thinking of the other. Here’s another example: as a kid I read a blurb in some magazine about Bob Seger’s new album where he was described as the hardest working man in music. At that age I had not yet heard that expression, and while I now know that it’s just a common phrase thrown around willy-nilly by marketing people, back then my brain took it as some kind of researched fact. Obviously I know better now, but I can’t hear a bob Seger song without hearing that blurb in my head. As you can imagine, it gets tiring having to repeatedly remind myself to disconnect unrelated associations and readdress all the unwelcome “laws” and “facts” created by these impressions time and time again. They hardly ever get replaced by new info, but rather new info is added and compiled with the first. So while do I know the truth, or at least my own opinions about certain topics, I still have to hear the first opinion I subscribed to about it in my head when the topic comes to mind, and then apply the new information immediately after. It’s tedious in my head. But every once and a while this flawed synaptic brain fritz does something not entirely tedious. Not long after Carrie Fisher’s death, I caught a video of her on Ellen where she was asked about her love of coca-cola. And she described how much she enjoys the cold sharp crispness of a fresh coke and how once it gets a little warm she can’t even finish it. As a long time lover of coke (and Fisher if I’m being honest), I could relate. I’m not as bad as her, I don’t open 16 cans a day and not finish them, but I have noted the pleasure of the cold sharp crispness of a freshly opened can and so her quirky anecdote resonated with me. 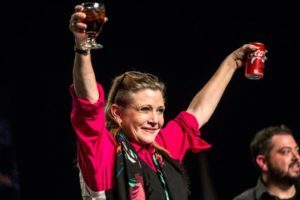 Now, every time I open a can of coke I think of Carrie Fisher, and it’s not unwelcome.